The drive to Fuller Gardens sets the stage nicely for the feast of the senses that this garden offers. We came from Hampton Beach where we had dropped off our son and his friends for fun on the boardwalk. 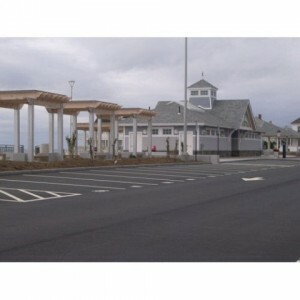 Route 1A north took us from the beach and through North Hampton past residential areas, stores, and restaurants. As we approached the gardens, our car hugged the winding road along the cliffs with dramatic views of the shore on one side and some rather grand estates on the other. 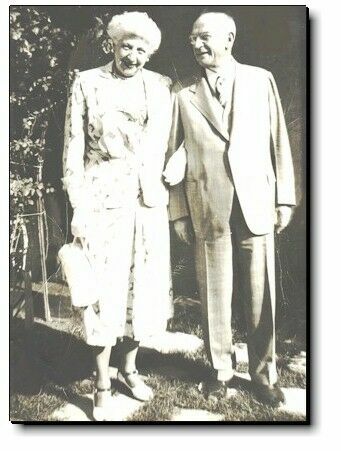 It stands to reason that it would be so since Fuller Gardens was once part of the estate owned Alvin Fuller, governor of New Hampshire during the 1920′s, and his wife Viola. 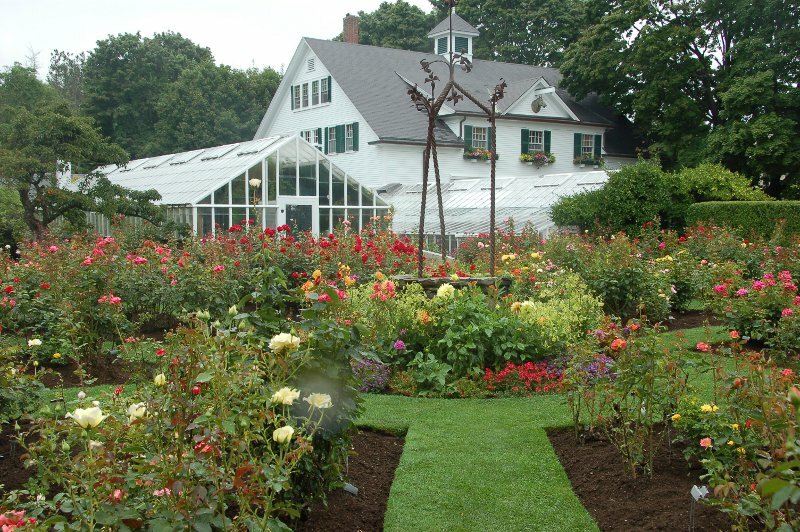 Viola loved flowers, especially roses, prompting Fuller to hire renowned landscape architect Arthur Shurtleff to design the gardens of his summer estate, Runnymede-By-the-Sea. Unfortunately, the mansion no longer exists as it was torn down in 1961, in keeping with Fuller’s wishes. However, the carriage house from the 1890′s and the greenhouses are still here and provide a lovely backdrop to the rose garden that greets you as you enter the gate. I spent a great deal of time just in the Side Garden, as this area is known, to not only photograph the beauty of the wide variety of roses, but to pause and inhale their heady fragrance at every turn. Oh, to fill a tub with their petals and just drown in the scent! It had just rained, so the petals were bejeweled with fresh rain drops. Not that they needed adornment. 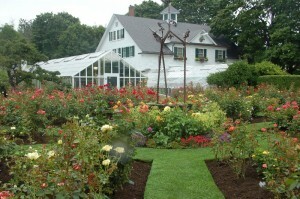 The Side Garden was designed in 1930 by Cherry Hill Nurseries in a circular pattern of rose beds with grass paths emanating from the antique well head in the center. It is enclosed by a privet hedge and a cedar fence on which grow espaliered apple trees. Espaliered apple trees are basically dwarf trees trained to grow along a fence; they are easier to maintain and harvest than regular trees and provide year-round beauty. It’s a technique started by the Romans and perfected by the French many centuries later. From the Side Garden you enter the Lydia Fuller Garden, created in memory of Lydia Fuller Bottomley, one of the Fuller’s five children, who died in 2004. This garden features more rosebushes leading to a fountain of a young woman kneeling to get a drink from the circular pond. 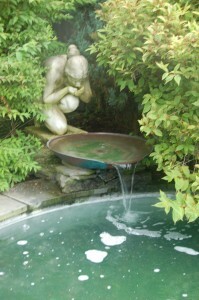 In fact, very fine statuary and fountains can be found throughout the gardens. Alvin Fuller collected these on his frequent travels to Europe. The various gardens that make up the Fuller Gardens follow the Colonial Revival tradition popular at the beginning of the 20th century. 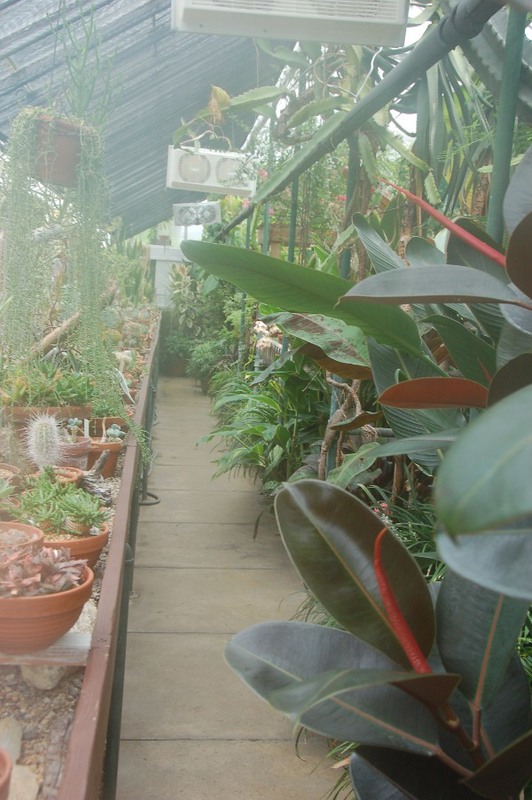 The 2 1/2 acre lot is comprised of a series of garden “rooms”; at Fuller Gardens, you walk from the Side Garden of roses to the Lydia Fuller Garden and then to the conservatory of tropical plants. 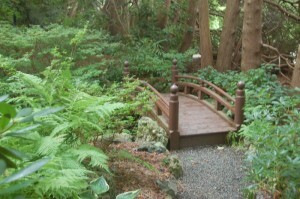 From here it’s a short walk to the wooded Japanese Garden with its koi pond, arching bridge, and Zen lantern. This naturally leads you to the Front Garden. But let’s go back to the conservatory. This greenhouse is chock full to the ceiling with tropical plants, such as bougainvillea, orchids, a huge pitcher plant, a staghorn fern resembling a moose head, as well as a great variety of succulent plants. Leaving the conservatory, I passed fabulous beds of dish plate dahlias and other perennials nestled between the conservatory and propagation houses. For a complete change of scene, I entered the wooded entrance to the Japanese Garden. On a hot, sunny day, it must be a welcome reprieve. It’s a garden meant to soothe the senses rather than stimulate them, with masses of ferns and other woodland plants, the gentle sounds of water flowing from the fountain of rocks to the bridge, with the only color being the orange, red, and yellow koi fish in the pond. The path leads you to the entrance of the Front Garden where you emerge into the sunshine once again. The Front Garden not only has a similar geometric display of roses to that of the Side Garden, but is also lined with perennials beds. The variety of perennials provide consistent color from spring to fall. When I visited, beds of annuals, such as dahlias, ageratum, zinnias, and New Guinea impatiens lined the steps leading to the long beds of perennials where plants, such as catmint, yarrow, speedwell, sea holly, coneflowers, phlox, and daylilies were in bloom. The focal point at the head of the garden is a dramatic fountain of a cherub blowing a horn, with other statuary at corners and along the side beds. The Front Garden was designed by the Olmstead Brothers in 1938 so the Fullers could enjoy it from their second story bedroom window since they did not go into the garden often. Also, they wanted people passing by to be able to go into the garden at anytime. It was the Fullers way of giving back to the public after the successes they had known over the years. The current director of the gardens is Jamie Colen. The improvements he has made include creating a new entrance way, putting in the stone wall with a gate, improving the parking area, and installing the brick patio area at the entrance. 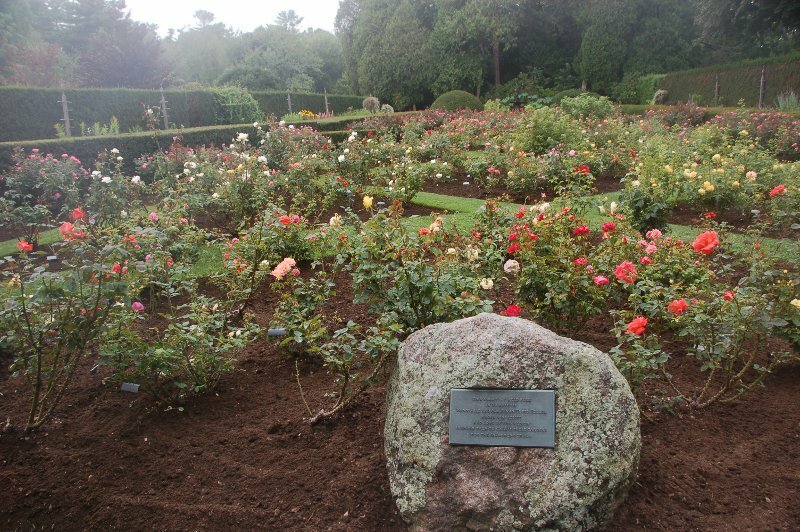 However, where the gardens themselves are concerned, he has kept them as historically accurate as possible based on the records of Edward Brown, the director and master gardener from the 1935 to 1943 and 1959 to 1971. Although the roses are the obvious stars of the show at Fuller Gardens with over 1700 bushes, you can enjoy the many tulips in bloom in early May as well as other bulbs and flowering shrubs as the spring progresses. 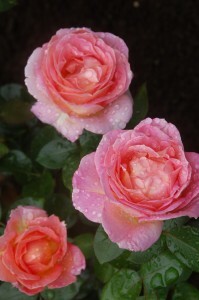 The roses bloom from late June into October. There’s consistent color and interest from a parade of perennials from spring into fall. In other words, it’s a great garden to visit throughout the growing season. I noticed a few families with elderly relatives who obviously could not do much walking (I know how that is myself!). This is the perfect garden for them as they can see it all without much exertion and rest at any point. If anything, it would be nice to just sit and take in the color and fragrance of the roses, the beauty of the fountains and statuary, and the general ambience of Fuller Gardens – a peaceful retreat from the hectic outside world. By the way, it’s been many years since my husband and I have been to Hampton Beach given that it was so rundown for many years. Well, that’s all changed. I was truly taken aback and pleased to see the vast improvements made. And these improvements, which include new bathhouses, a boardwalk, and a new Seashell Stage complex, have happened only in the past few years. The $14 million facelift has been long overdue and can certainly be justified by the revenue the beach brings in annually – around $170 million. So make a day of it – see Fuller Gardens, have a great seafood lunch at any of the restaurants on the way to Hampton Beach. Stroll the boardwalk, sit in the wonderful covered areas in front of the bathhouses, enjoy an afternoon concert in the Seashell complex, or go down to the beach and relax.